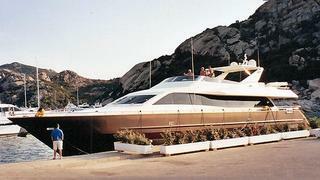 Johannes Brechmann at Yacht Moments sends news that he's signed the 28.2m motor yacht Alrisha for sale. A Tecnomar Nadara model, she was built in 2007 and accommodates eight guests in a master suite, VIP stateroom and two twin cabins plus a Pullman berth while twin 1825hp Caterpillar engines give her a cruising speed of 28 knots and maximum speed of 30 knots. Lying in Mallorca, Alrisha is asking €2.75 million.